July 3, 2012 - The International Air Transport Association (IATA) announced global traffic results for May showing a general downward trend in line with deteriorating global economic conditions. While passenger demand was 4.5% ahead of levels in May 2011, growth was virtually flat compared to April. Capacity increased by 4.0% and load factors stood at 77.6%, below the historically high levels recorded in April. May freight demand was 1.9% below previous year levels. Compared to April, the freight market contracted by 0.4%. Freight markets hit a low during the fourth quarter of 2011. Since then, they have basically moved sideways with just a 1.5% improvement on that level by May. The freight load factor stood at 45.3%, unchanged from the previous month but 1.2 percentage points below May 2011 levels. “The airline industry is fragile. Relief in oil prices provides some good news. Unfortunately, the softness in oil markets comes on the back of fears of deterioration in the European economy. Business and consumer confidence are falling. And we are seeing the first signs of that in slowing demand and softer load factors. This does not bode well for industry profitability. 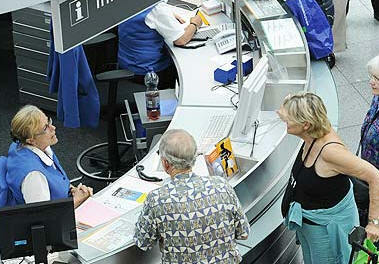 Airlines are expected to return a $3 billion profit in 2012 on $631 billion in revenues. That’s a razor-thin 0.5% margin,” said Tony Tyler, IATA’s Director General and CEO. International International passenger demand was up 5.6% compared to May 2011. That is well below the 7.1% growth recorded in April. All regions, except the Middle East, saw growth in passenger demand slow in May compared to April. A 4.1% capacity expansion, however, helped improve load factors from 75.9% in May 2011 to 77.0% for the current month. European carriers posted 4.1% growth on international services when compared to the previous May. This is significantly below the 5.7% year-on-year growth recorded for April. The region’s load factor of 78.5% was 1.5 percentage points ahead of the global average. Traffic growth for European carriers basically stopped at the end of 2011. Since the beginning of 2012, the growth trend has been basically flat, in line with the economic pessimism throughout the continent. North American airlines experienced a 1.5% increase on international demand in May compared to the previous year. This is below but relatively unchanged from the 1.6% year-on-year growth recorded in April. Load factors for the region’s carriers averaged 82.1% for the month, the highest among the regions. This reflects the tight capacity management conditions which are supporting the recent upward revision of profitability prospects to $1.4 billion (slightly ahead of the $1.3 billion that the region’s carriers made in 2011). Asia-Pacific carriers showed a 5.5% expansion in demand over the previous year period. This was ahead of capacity expansion of 3.1%, pushing load factors to 75.4%. In April, the region’s carriers recorded 8.6% growth—heavily skewed from the impact of the Japanese earthquake and tsunami in 2011. Compared to April, demand actually declined 0.8%, while load factors slipped 0.4 percentage points. Middle East carriers showed the strongest growth at 15.8%, outstripping capacity expansion of 11.9%. Load factors were the second-weakest among regions at 74.0%. This is, however, a 0.4% point improvement compared to April. The Middle East carriers were the only ones to report aggregate accelerated demand growth compared to April, when the region’s airlines reported 15.2% growth. Latin American airlines recorded solid growth of 7.4%. This was ahead of a 5.5% capacity expansion and left load factors at 77.1%, 1.4% points ahead of May 2011 levels. African airlines saw demand growth of 9.7% compared to May 2011, below a capacity expansion of 11.8%. Load factors stood at 62.9%. Domestic markets grew at slightly less than half the rate of international markets, just 2.7%. This was significantly below the 4.1% year-on-year growth recorded in April. Load factors of 78.8% were 0.8% points below the 79.6% reported for May 2011. Japan experienced the strongest traffic growth, up 14.8% year-on-year. If we strip out the impact of the Japanese earthquake and tsunami, IATA estimates that Japanese domestic traffic still would have improved year-on-year by about 4%. Load factors of 58.4% were the lowest among major domestic markets. China’s domestic demand has slowed to growth rates last seen in early 2011. This reflects a slowdown across the Chinese economy. Traffic rose 4.4% against an 8.3% increase in capacity, pushing load factors down to 78.6%. Compared to April, domestic demand was virtually unchanged. US domestic demand slipped 0.1% in May while capacity rose by 0.3%. Load factors dipped slightly to 84.3%, still the highest among all the domestic markets. Brazil experienced the strongest growth after Japan, with traffic up 7.2% on a 6.7% rise in capacity. Load factors rose to 65%. However growth softened compared to April, declining 3.1%. Indian domestic traffic rose just 0.1% year-over-year, but fell 2.7% compared to April. Load factors stood at 76.8%. Air freight markets stood at 1.9% below previous year levels in May. Compared to April, there was a 0.4% contraction. Taking a broader perspective, air freight has improved by a small 1.5% since hitting bottom in 2011. But this growth has been narrowly focused on the Middle East carriers. European airlines experienced the steepest decline in freight traffic, posting a 5.7% decline compared to a year ago on a 1% rise in capacity. North American airlines had a 1.9% drop in demand while capacity was trimmed by 1.6%. Asia-Pacific carriers saw a 4.1% decline in demand in May compared to the previous year, while capacity dipped just 1.7%. Latin American airlines’ demand rose 0.2%, while capacity climbed 0.5%. Middle Eastern carriers posted a 12.4% increase in demand, which exceeded an 11.7% rise in capacity. Half of this year’s growth in cargo markets has been captured by the Middle East carriers. African carriers’ results were not available but will return next month. The Rio+20 meeting brought together over 22,000 delegates to discuss the future of the planet. About 15,000 athletes, over 20,000 media and many more spectators will converge on London to watch the Olympics. And some 600 million people are expected to fly over the months of July and August as families and friends reunite, businesses find new opportunities and travelers experience new lands. “Whether bringing people together or moving cargo around the globe, aviation is vital to modern life. The G-20 leaders recognized the critical role of aviation which is the backbone of travel and tourism that is a vehicle for job creation, economic growth and development. Now we need governments to move from recognition to action with tax policies that don’t kill growth, regulation that enables growth and infrastructure to accommodate growth,” said Tyler.